Secretary-General Ban Ki-moon (right) meets with Nadia Murad Basee Taha, a young Iraqi woman of the Yazidi faith, human rights activist and survivor of abduction and torture by the terrorist group Islamic State, on the margins of the World Humanitarian Summit in Istanbul. 24 May 2016. With the appointment, which marks the first time a survivor of atrocities is bestowed this distinction, Ms. Murad, a 23-year-old Yazidi woman, wears the mantle of Goodwill Ambassador for the Dignity of Survivors of Human Trafficking of the UN Office on Drugs and Crime (UNODC). “Nadia is a fierce and tireless advocate for the Yazidi people and victims of human trafficking everywhere,” UN Secretary-General Ban Ki-moon said at her induction ceremony today, which was held in connection with the UN’s commemoration of the International Day of Peace. 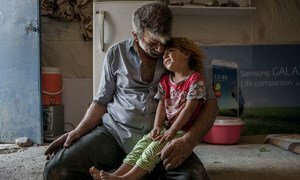 “She was subjected to unspeakable abuse and human rights violations at the hands of ISIL. Nadia has shown exceptional courage in speaking out. She gives a much-needed voice to trafficking victims who continue to suffer, and who demand justice,” the UN chief added. Ms. Murad briefed the UN Security Council in its first-ever session on human trafficking in December 16, 2015. She described being rounded up with fellow Yazidis in Iraq in 2014 and witnessing as ISIL fighters shot men and boys in cold blood. She was bought and sold various times. During her Ambassadorship, she will focus on advocacy initiatives and raise awareness around the plight of the countless victims of trafficking in persons, especially refugees, women and girls. UNODC is the lead UN entity fighting all forms of human trafficking, including sexual slavery, forced labour, child soldiering and trafficking for the purpose of organ removal. It is also the custodian of the UN Protocol to Prevent, Suppress and Punish Trafficking in Persons, Especially Women and Children and mandated to manage the UN Voluntary Trust Fund for Victims of Trafficking in Persons. “Nadia’s appointment as a United Nations Office on Drugs and Crime Goodwill Ambassador, provides a unique opportunity to urge others to join us in our fight against human trafficking. We know that Nadia's extraordinary commitment to the plight of trafficking victims will move people to take action against this scourge,” UNODC Executive Director, Yury Fedotov, said in his message on her induction. With military action turning towards retaking Mosul, Iraq’s second largest city, the United Nations refugee agency warns that displacement may worsen “dramatically,” and announced preparations to ramp up operations and set up additional camps.